Street Child is incredibly grateful to the the media outlets that dedicated airtime and column space over the festive period, when we were mainly enjoying the company of friends, family and good times, to help Street Child continue to bring attention to those experiencing the worst of times - Ebola's orphans. On Christmas Eve, ITV News carried a special report in their main evening news show from John Thorpe village on the edge of Freetown. John Thorpe has lost 10% of its residents to Ebola and Street Child is striving to help the children left behind, one of whom discussed the tragic contrasts between this Christmas and previous Christmases for her and her family. 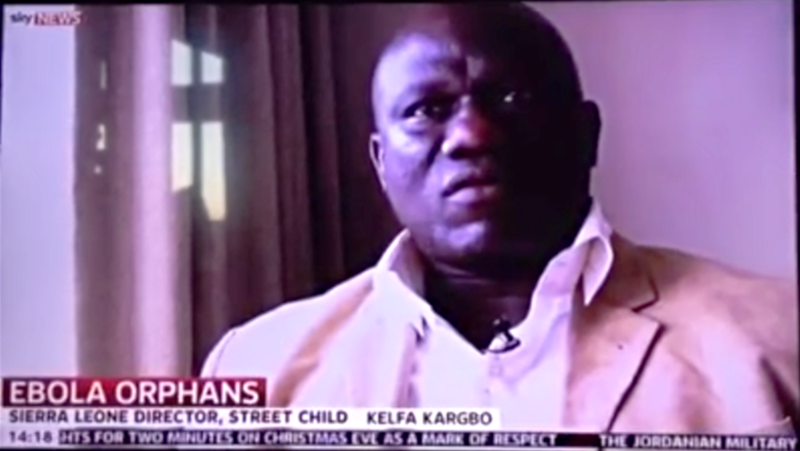 On Christmas day, Sky News also carried Street Child's footage from John Thorpe throughout the afternoon - and a strong interview with Country Director, Kelfa Kargbo. View the report here. On Boxing Day, the Mail Online published an extensive and moving article following up on the support Street Child had given to to three families of orphans - families whose plight had been reported on in previous Mail reports. It emphasised Street Child's plans to provide further business support to these families - to build sustainability. View the article click here. On 27th, The Eastern Daily Press (EDP), the UK's best-selling local morning paper published a 'Christmas appeal' from local Norfolk girl, Street Child's Liberia Programme Director, Chloe Brett - following on from her most recent trip. And on Sunday 28th, The Sunday Mirror appealed, for the final time this Christmas, for its readers to support Street Child's Ebola Orphan project.